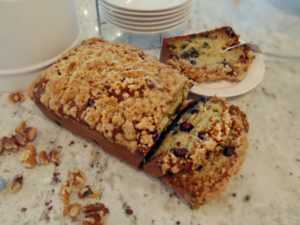 I start this recipe as if I was making my Grandmother Catherines’ timeless banana bread, then changed it up by adding fresh blueberries. If you don’t have fresh blueberries, adding frozen will work fine. Then, only because my husband asked that I not forget the walnuts, I incorporated them into this recipe. Sadly, I am not a fan of walnuts in cookies, cakes, or breads and knowing I was going to need him as my test kitchen again, I decided to humor his request. A few changes to this classic treat resulted in a successful day of baking. Let me know what you think of this sweet blueberry and banana creation. To start, add walnuts to a food processor and pulse for one minute or until they become a fine consistency. 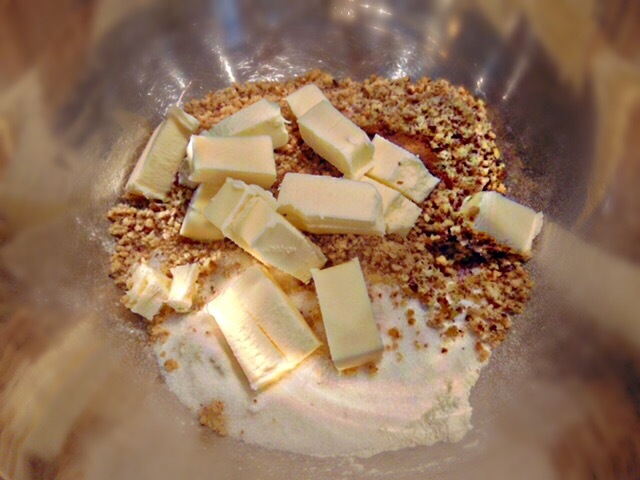 Add the walnuts, flour, sugar and chilled butter to a large mixing bowl. 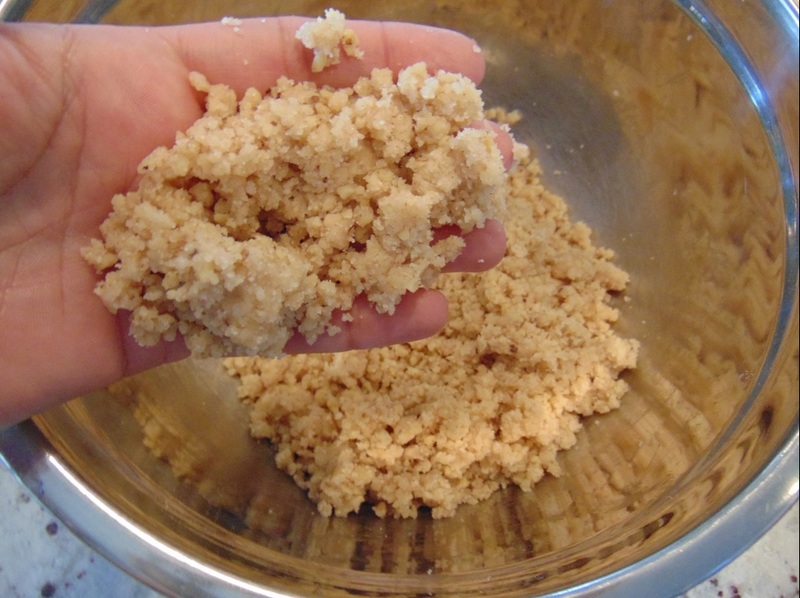 Using your hands, work in the cold butter pieces to the dry mix until crumbles form. Set aside 1 cup of the mixture. You can freeze the rest in a plastic storage bag. 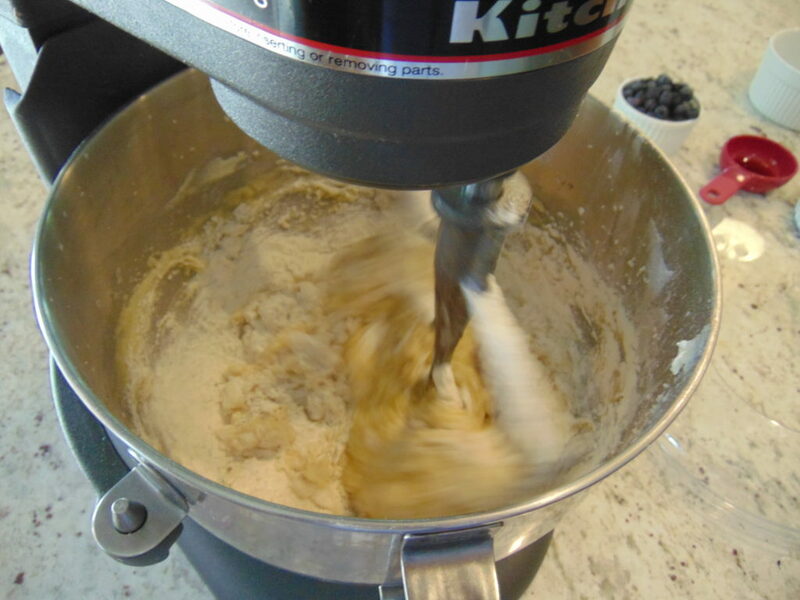 Using a standard mixer set on medium speed cream together the butter, vanilla, and sugar for 2 minutes or until fluffy. Lower the mixer speed. Add the eggs and bananas. Continue to mixing for another minute. In a separate bowl combine the sifted flour, baking soda and salt. Slowly add the dry ingredients to the mixer in three parts allowing a gentle mix and continue on a low speed for another 2 minutes. Remove the mixing bowl from the mixer. Using a spatula, gently fold in the blueberries. Grease the bottom and sides of a loaf pan with butter or cooking spray, then add a pinch of flour to coat the pan. 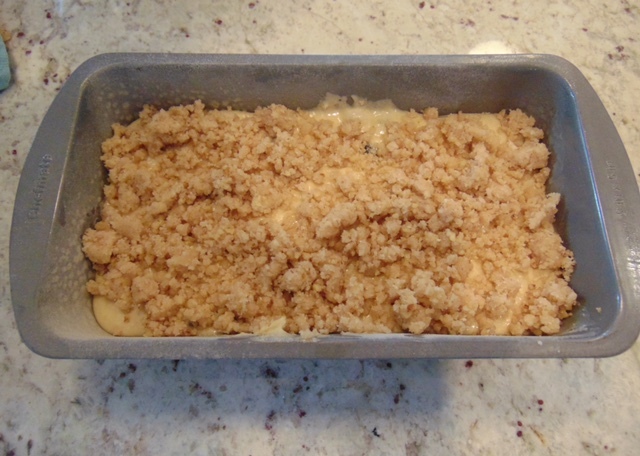 Pour the batter into the loaf pan, and top it with the walnut crumb mixture. Place loaf in the preheated oven and bake for 45 to 50 minutes. Lite and fluffy blueberry- banana bread with sweet walnut crumbles. 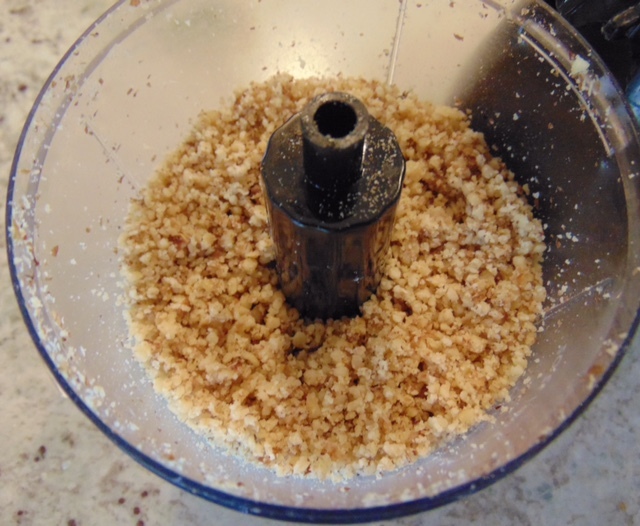 Add walnuts to a food processor, pulse until they become fine. About 1 minute. Add the walnuts, flour, and sugar to a large mixing bowl. Cut the chilled butter into pieces. Then using your hands, work in butter pieces to the dry mix until large clumps form. Set 1 cup of mixture aside. Using a standard mixer, cream together butter, sugar, and vanilla until fluffy. Add eggs and bananas, then continue to mixing for about two minutes on low speed. In a separate bowl, sift together flour, baking soda and salt. Add these dry ingredients to the mixer and continue on low for another 2 minutes or until thing is blended nicely. 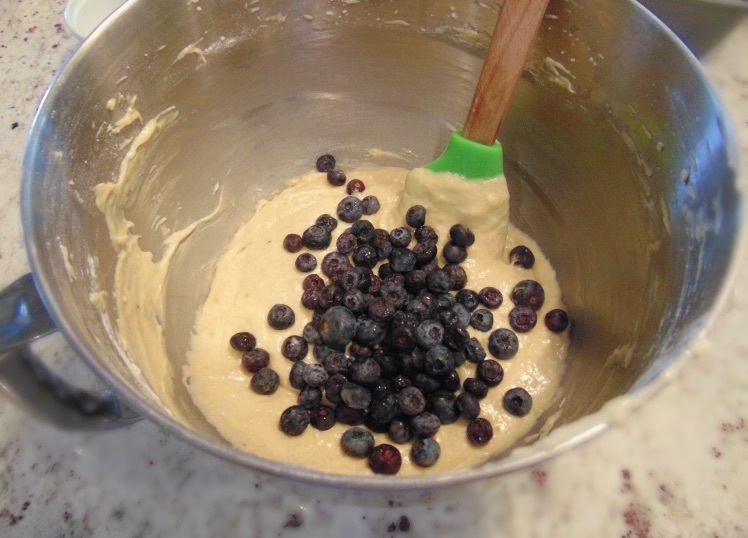 Remove the bowl from the mixer, and gently fold in the blueberries using a spatula. Pour the batter into a greased and flour loaf pan. Bake at 350° 45-50 minutes.